A top-level thought leadership programme, from November 24 to 30. Working together with external experts from the food industry, academia, market research and more, organiser UBM has created an inspiring line-up of topical presentations and workshops. 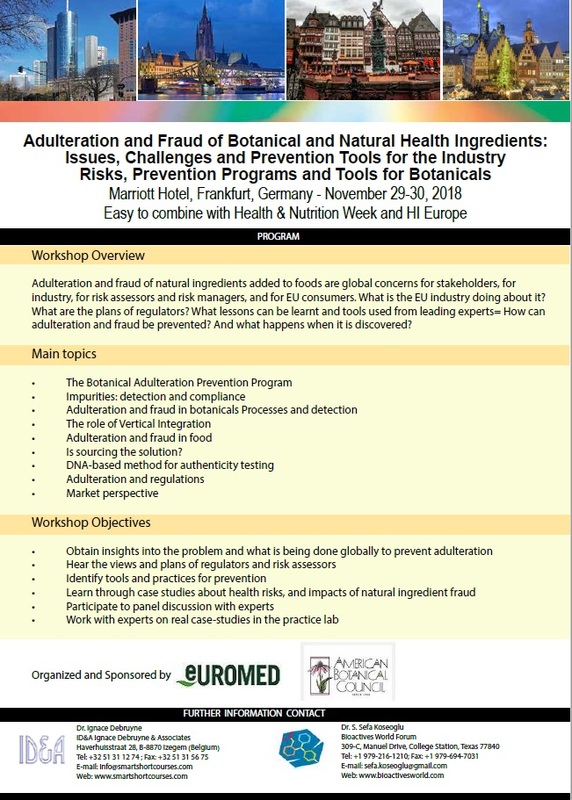 Smart Short Courses joins forces with Euromed and the American Botanicals Council and brings a completely new program on ADULTERATION and FRAUD of Botanical and Natural Health Ingredients. Adulteration and fraud of natural ingredients added to foods are global concerns for stakeholders, for industry, for risk assessors and risk managers, and for EU consumers. What is the EU industry doing about it? What are the plans of regulators? What lessons can be learnt and tools used from leading experts = How can adulteration and fraud be prevented? And what happens when it is discovered? Fill out the form below and click Join.